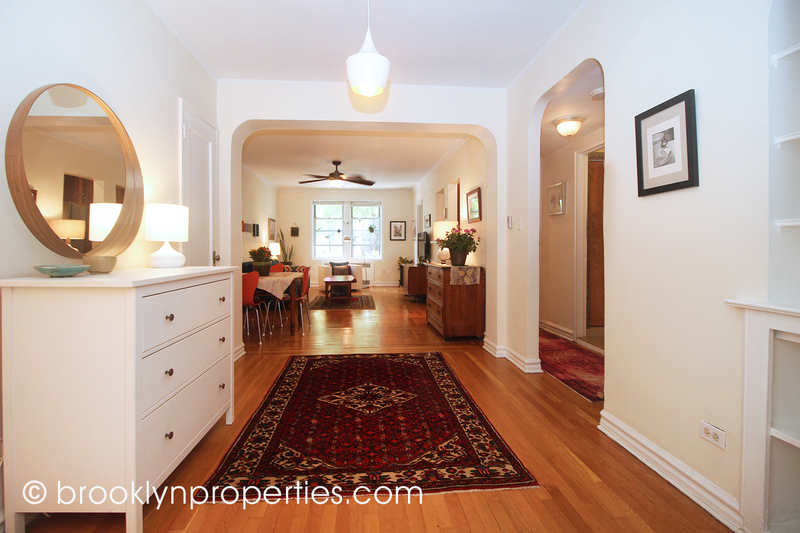 Warm and welcoming family home on a quiet tree-lined street in Ditmas Park where you can move right in and enjoy! You enter thru a spacious & gracious foyer to the large pre-war two-bedroom coop with parquet floors, arched doorways and built in shelves for your treasures & memories. The sprawling living/dining space lays out before you with large windows and many options for decorating. The extra-large ceiling fan has curved blades for your comfort. There is a separate, updated kitchen, with a pass thru. New Caesarstone countertops and a stainless steel sink will be installed soon. The kitchen has a stylish ceramic tile backsplash and stainless steel appliances, including a new brand Samsung 5-Burner Self-cleaning Convection Gas Range with hood, dishwasher and large capacity fridge that is just one-year old. The two bedrooms are separated for extra privacy and quiet. The master bedroom is huge and can easily accommodate a king-sized bed and the second bedroom has two exposures and each features a ceiling fan and blackout shades. Great storage throughout, with a total of six closets. The windowed bathroom has ceramic tiles with decorative glass tile accents and a separate shower, that is currently used as a linen closet. The Hamshire Arms coop is a well-run building with strong financials, high owner occupancy and a live in super. There is storage in the basement, a bike room and two laundry rooms for your convenience. Plus, it is one of the few pet friendly buildings in the neighborhood! It is located a few short blocks to the Newkirk Plaza subway station serviced by the B and Q trains for a quick commute to Manhattan, and the many goods and services nearby including the supermarket, hardware store, pharmacy, dry cleaners, bagel shop and great coffee. Not far from Flatbush Food Coop and all of the great restaurants on Cortelyou Rd.